Seaweed can come in many forms and are particularly popular as a food source in coastal countries such as Japan, where seaweed has been eaten for thousands of years. Wakame, konbu, nori… there are many different types of Japanese seaweed that are delicious and healthy, but what are the differences and which ones should you use when cooking Japanese food! Japan Centre has the answers… read on for more details. 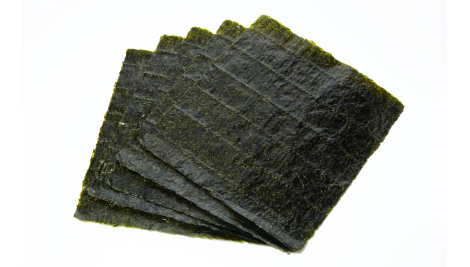 Nori is probably the most common and well recognised of all types of seaweed due to its use in sushi. You know the dark green wrapping on maki sushi rolls? That’s nori. Made from Porphyra, a red alga type of seaweed that grows in abundance in the seas around Japan, nori is made in a similar way to paper with layers of the seaweed pressed together and then dried. The finished product is usually a thin square sheet of nori approximately 20cm wide which is used in a variety of ways. The most common way to use nori is in sushi. Maki sushi rolls are made by rolling rice and sushi fillings in a sheet of nori and then slicing the roll into small bitesize pieces. Temaki sushi is a type of sushi that is rolled by hand and resembles a giant cone full of rice and tasty ingredients. Onigiri are rice balls usually shaped into a triangle and then wrapped up with nori so they can be eaten with you hands. This is a common Japanese snack or bento box filling for lunch. 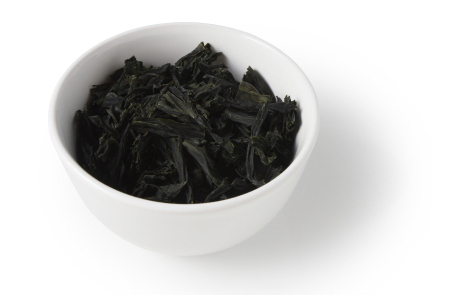 Wakame is a type of seaweed that is most popularly served in miso soup in Japan. 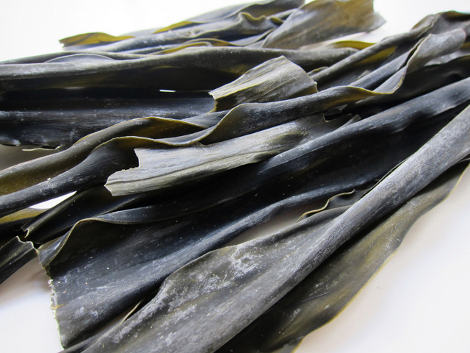 After being harvested, wakame is sliced into small pieces and dried before being packaged up. After purchasing it, you simply need to soak the wakame in water to reconstitute and it will expand as it absorbs the liquid. Wakame is considered one of the healthiest seaweeds in Japan and is a favourite for people looking to increase the health of their skin and hair. It has also been found in a recent study at Hokkaido university that wakame can even help to burn fatty tissue! With tofu cubes and sliced spring onion, wakame is an essential addition to any bowl of authentic miso soup. Simply add a handful of wakame when you are making miso soup to get the authentic taste and the great health benefits. Wakame is also popular in Japan to make salads. As wakame has a slightly sweet flavour to it, it works perfectly with a selection of salads to give an extra taste dimension. Konbu is an important part of making dashi stock due to being is rich in umami flavours. This makes it ideal to infuse with katsuobushi bonito flakes to get that rich Japanese flavour. After making dashi, the konbu can be sliced and eaten or sometimes pickled with rice vinegar and eaten as a snack. Konbu is also full of dietary fibre and iodine which makes it another healthy addition to traditional Japanese food. Konbu is soaked in water for 20-30 minutes before adding katsuobushi bonito flakes and then being strained to create a rich tasting dashi stock that is used for a variety of different Japanese dishes. Tsukidani is made by cooking konbu in a mix of soy sauce and mirin to create a rich tasting side dish that is often served with rice. Konbu can also be steeped in hot water to create a delicious savoury tea called konbu-cha. 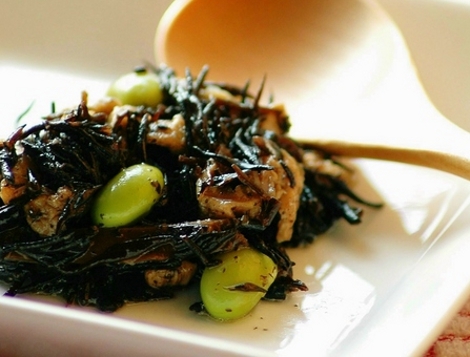 Hijiki is a type of seaweed that is used most often as a side dish. After the seaweed has been harvested, it is dried and then cooked with soy sauce and sugar to create a delicious, slightly sweet snack. The small, thin strips of hijiki seaweed look like grass and match the kanji characters used to write it in Japanese as “deer tail grass”. Hijiki is rich in minerals, such as iron, calcium and magnesium and is said in Japan to be a great way to keep hair thick and lustrous. Most commonly served as a side dish, hijiki is cooked in soy sauce and sugar to make a tasty food that can be eaten on the side, or served with rice. In Japan, you will often get a bowl of hijiki mixed with carrots and edamame beans as an appetiser in izakaya drinking bars. Along with katsuobushi, sauce and mayonnaise, aonori is one of the main toppings to put on top of these classic Japanese festival dishes. 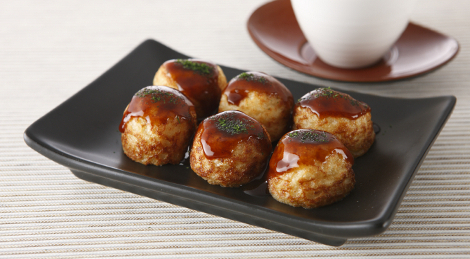 Simply sprinkle the aonori on any hot dish to get the classic flavour. Be sure to check out Japan Centre where you can find all these delicious and healthy seaweeds and many more recipes to help get the most from your Japanese ingredients. 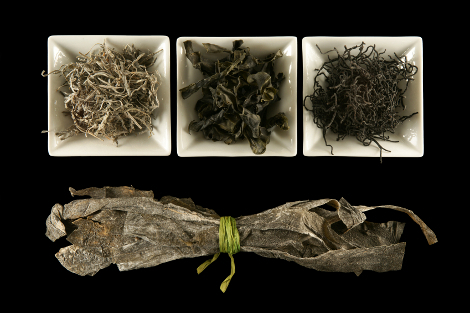 Posted in Food and tagged Hijiki, Konbu, Seaweed, Wakame. Bookmark the permalink.